EMBATTLED MMD leader Nevers Mumba has officially decided to take a ride with opposition UPND ahead of the general elections, barely a week after former Lunte Member of Parliament Felix Mutati became president of the party by sailing through unopposed during the party convention held at the Mulungushi Rock of Authority in Kabwe last Saturday. But yesterday, Dr Mumba decided to officially sign a memorandum of understanding (MoU) with Mr Hichilema with the sole purpose of working together ahead of the August 11 general elections. The MoU also stipulated that the two political parties should continue working out modalities of furthering their partnership. Speaking during a press briefing organised by former Chongwe Member of Parliament Sylvia Masebo and Dr Mumba’s treasurer Elizabeth Chitika at Chainama hotel yesterday, Dr Mumba said the national executive committee (NEC) convened last week in Chibombo and unanimously resolved to form an alliance with the UPND ahead of the August 11 general elections. Dr Mumba did not go with any former MMD Member of Parliament to endorse the candidature of Mr Hichilema. But MMD trustee member Mwansa Mbulakulima charged that Dr Mumba acted emotionally when he announced an alliance with the UPND. Commenting on an alliance, Mr Mbulakulima said Dr Mumba should have reflected on his political and personal life before running to UPND. Mr Mbulakulima said Dr Mumba has not solved any of his many problems by resolving to form an alliance with the UPND. “Mumba should have reflected through his MMD leadership bumpy journey,” he said. Mr Mbulakulima said Dr Mumba should have first of all resolved his problems and gone as a clean man to the UPND because even where he went he would find his enemies who left him. He said the twelve former Members of Parliament who recently endorsed and joined the UPND left the party because they did not agree with the leadership style of Dr Mumba and now he would find them in UPND. Mr Mbulakulima said Dr Mumba’s journey from the time he took over the MMD presidency from former Republican President Rupiah Banda his journey had always been bumpy up to date. He said Dr Mumba had only taken his problems to the UPND following his decisions to back president Hichilema. “I know Mumba very well. I don’t think this decision has come from deep down his heart. “He (Mumba) has acted emotionally to what happened in Kabwe at the convention. We have talked about this issue before with him (Mumba) and I know that the decision did not come from his heart but he has emotionally reacted,” Mr Mbulakulima said. But Dr Mumba said a dedicated team of 55 NEC members representing about 95 per cent of the NEC general membership voted in favour of the decision that the party should form an alliance with the UPND. Dr Mumba said the two political parties (UPND and MMD) have since set up a working committee based on Mr Hichilema’s 10 point plan of his manifesto. “I am here to ignite the passion for change of government. I am not asking for any position… I want that of a mere servant of this alliance,” Dr Mumba said. He affirmed that Mr Hichilema was the best quality leader for the August 11 general elections. Meanwhile, Mr Hichilema said Zambia was in an economic crisis and that Zambians were heart-broken with the leadership of the Patriotic Front (PF) government. 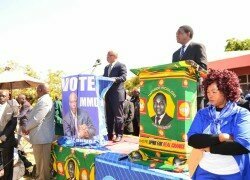 Mr Hichilema also said Lusaka had cholera because the nation had no leadership. “You need a cow to produce milk,” Mr Hichilema said. He said the UPND and Dr Mumba’s MMD would consolidate and harmonise the two political party policies. Mr Hichilema said he would share management skills and strength with Dr Mumba as a value of working together. Former vice-president Dr Guy Scott and former Kasama Central Member of Parliament Geoffrey Bwalya Mwamba were Mr Hichilema’s witnesses when the MoU was being signed while Rev. Reuben Sambo and Winnie Zaloumis were Dr Mumba’s witnesses. Others who attended the press briefing included Bob Sichinga, Edgar Keembe, Edith Mataka, Michael Mabenga, Garry Nkombo, Cornelius Mweetwa, Elijah Muchima among other notables.